When I relaunched ThePhysicalEducator.com back in December, there was a key element of the site that wasn’t quite ready for launch day: the QR Sport Skill Posters. Although my original intention was to have the new version of the posters released by January, it turns out that they took a lot longer to produce than expected. I kept working at the design, but couldn’t get it quite right. Today, I’m happy and excited to be finally releasing the latest iteration of the QR Sport Skill Posters! Before I show them to you, here’s a bit of a background on what they are, why they left, and what’s so special about them now. Back in 2010, I stumbled across a blog post by Jarrod Robinson (the O.G. #PEGeek) in which Jarrod shared how he was using QR codes to enhance the homework sheets he was creating for the math class he taught at the time. The idea was simple but powerful: to create a video in which the teacher explains the problem and then link to that video via a QR code on the physical sheet. This way, students could “access” their teacher if ever they became stuck while completing their homework assignment. My mind was blown away by this incredibly innovative use of QR codes in education and I immediately got to thinking about how it could be applied in a physical education context. At the time, I was working on some educational visuals to help students master different sport skills. Nothing too novel: just a visual representation of each step of the skill combined with some learning cues to help students master said skill. As I thought about Jarrod’s math sheets, I started to realize that these sport skill posters could be greatly enhanced through the use of QR code technology. My first idea was the obvious one: place a QR code on the poster that linked to a video of the skill being performed. After trying that out (and really liking it), I started to think about how else QR codes could bring value to this resource. Eventually, I decided to see if I could create different codes that linked to practice activities that were designed to meet the needs of different levels of learners. By the time I was done, the poster had four codes on it: one that linked to the video of the skill being peformed, one that linked to a “beginner” practice activity, one that linked to an “intermediate” practice activity, and one that linked to an “expert” practice activity. I started using the poster in my teaching and fell in love with how it allowed my students to work independently from the teacher, get as much information as possible on the skill, and select an appropriate amount of challenge for themselves. Eventually, with a ton of help from my friend/original website partner Mike Cicchillitti, I created more of these posters and shared them on ThePhysicalEducator.com. Over time, in an effort to make the resource as visually appealing as possible, I changed the design of the posters and the activities associated to them. Last year, I started getting messages from teachers telling me that the QR codes on the posters were no longer working (i.e. teachers/students were receiving an error message when they tried scanning the codes). Although it took me a while to figure out what was going on, it turns out that the platform I had used to create the QR codes in version 3.0 of the posters (my beloved Scan.me) had shut down its QR code hosting services which rendered the codes useless (thanks Scan.me). I started working on fixing the QR codes on the posters, but I was also dealing with a website that was basically being held together by duct tape and hope. I told myself that the posters were due for a refresh anyway, and that I would launch a redesigned version of them when the site relaunched. I got to work on the new posters, came up with some really cool ideas on how to make them better and, as per usual, wound up taking a lot longer than expected developing them. That said, the first posters are ready to go and I’m super pumped to be sharing them with you today! The new posters feature (what I think is) beautiful vector artwork along with text that helps break down each step of the skill into easy-to-understand cues. The posters are now 11″x17″, making it easier for students to read the text and scan the QR codes. The main QR code links to a video of the skill being performed at regular speed and then again in slow motion. During the slow motion portion of the video, I included annotations to highlight the main cues of the skills as they are being performed. The Learn More QR code links to a kinetic typography (i.e. animated text) video which provides additional information on the skill and the context in which it is normally used in game situations. Each poster has three practice activity QR codes that link to practice activities of different degrees of complexity: Beginner, Moderate and Advanced. Each practice activity is explained through an animated video, similar to the videos you would find for the games in my Standards-Based Games Database. Having these three codes on the poster allows students to self-differentiate their learning and, therefore, increases independent learning in class. The posters now all have a QR code that links to a Coaching Clipboard for that skill. The Coaching Clipboard is a PDF document that serves as a peer-assessment aid. The document includes the main cues of the skill, along with what the “coach” (i.e. student performing the peer-assessment) should be looking for. Also, the document provides strategies for providing quality feedback and ideas on how to increase/decrease the difficulty of the practice activity. All in all, I’m really pumped with how these posters turned out and love the way they are working in my lessons! Here’s the thing: the QR Sport Skill Posters were always a free resource on ThePhysicalEducator.com. However, considering the amount of work that goes into each poster, I’ve decided to make the QR Sport Skill Posters a premium resource. The posters will be available in sets of two and each set is available in The #PhysEd Shop for $8. 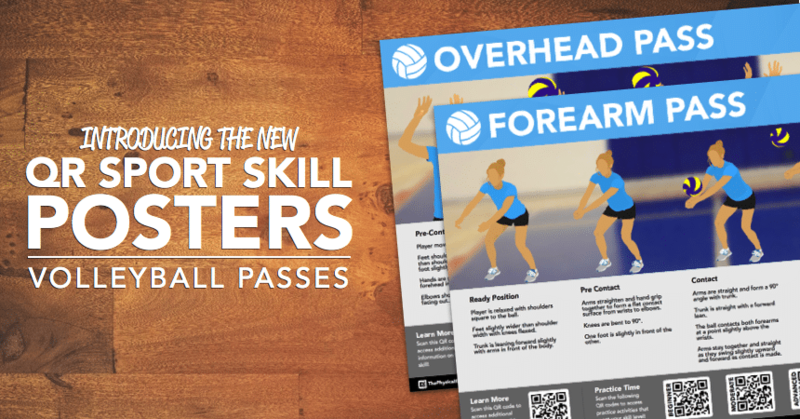 I will be adding more and more posters over time, but right now you can find the Volleyball Passes Set in the shop! All that being said, I also decided to also create a free version of the QR Sport Skill Posters. Although I think $8 is a respectful price considering the work that went into this resource, I know that even $8 can be a lot for teachers working with little to no budget in P.E. The free posters are smaller (8.5″x11″) and contain three of the six QR codes their premium counterparts showcase: Learn More, Video Breakdown, and one Practice Activity (beginner). You can access the free version of the QR Sport Skill Posters in the Skill Posters section (where you will also find the free versions of the FMS Manipulative Skill Posters). I hope you enjoy the posters and that they help your students master as many new skills as possible. I’m excited to have them back on the website and look forward to creating more and more as time goes on!